In December of 2017, IDFG Officer Steve Ross initiated an investigation into illegal hunting activities north of Rupert. Jake Pelton, Isaiah Cofer, Jamey Larson, Trevor Blincoe and Brenner Antone were interviewed and subsequently charged for their involvement in the unlawful killing and/or waste of multiple deer and small game animals, including one trophy class mule deer buck. Idaho Fish and Game is adding three proposals for the 2019-20 big game hunting season for eastern Idaho mule deer hunts and elk hunts in the Weiser and Brownlee zones in response to new information. A number of exotic lice have been introduced to North America with the introduction of exotic deer and antelope including Bovicola tibialis and Damalinia (Cervicola) forficula. A number of exotic lice have been introduced to North America with the introduction of exotic deer and antelope including Bovicola tibialis and Damalinia (Cervicola) forficula, among others. The typical native hosts of B. tibialis and Damalinia (Cervicola) forficula are fallow deer (Dama dama) and axis deer (Axis axis), and hog deer (S. porcinus), respectively. Both of these lice species have been documented on feral fallow and axis deer on Point Reyes National Seashore in California, possibly as early as 1970, but confirmed again in 2005. Black-tailed deer with hair loss in British Columbia during the 1940’s were found to be infested with B. tibialis and the same louse was found on large numbers on captive black-tailed deer in Mendocino County, CA, in the 1970’s. Introduced fallow deer were associated with both of these incidences of exotic lice on black-tailed deer. Re-examination of lice from the voucher specimens of lice from the Pacific northwest have found some misidentification of some specimens, with B. tibialis being found, possibly in association with hair loss similar to that reported more recently in Washington, Oregon, Idaho, Wyoming and South Dakota. A syndrome of hair loss and juvenile morbidity and mortality in Columbian black-tailed deer (Odocoileus hemionus columbianus) in western Washington was recognized in 1995-97 and an exotic louse, Damalinia (Cervicola) forficula, was identified on black-tailed deer in Oregon and postulated as the cause of the hair loss syndrome (Bildfell et al. 2004). 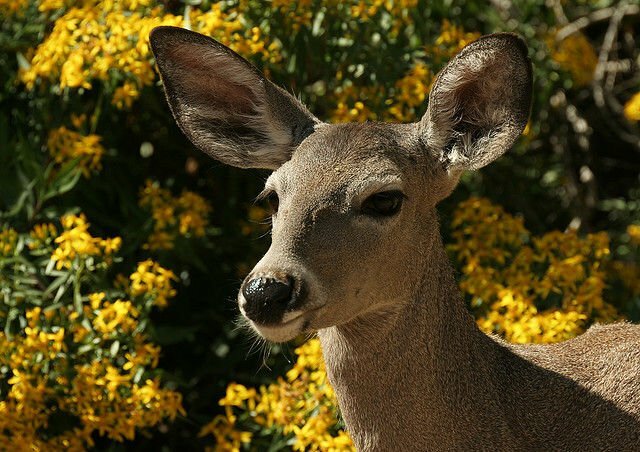 Deer population declines in both Washington and Oregon have been associated with high infestations of D. forficula and the associated hair loss in late winter, especially in fawns. Over-winter fawn mortality in populations affected with hair loss syndrome varies from 20-100% and has resulted in significant reductions of local populations. Another exotic louse, Bovicola tibialis, was documented in several urban areas of Idaho including Riggins, Boise, Elk Bend, and Salmon.